← ArtScroll’s June Sale – 20% off all books! Here at ArtScroll, we have so many exciting new releases. Too many, in fact, to choose just one title for our next giveaway! So instead…we’ll let you pick! 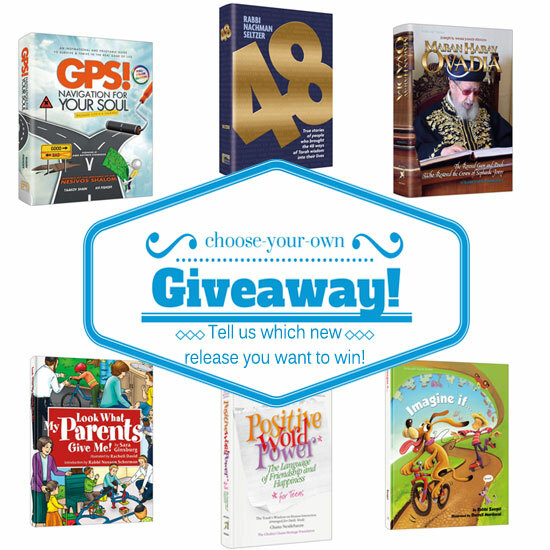 Which new title from ArtScroll would you like to win? 1) GPS: By Yaakov Shain and Avi Fishoff – Fun and authentic Torah, GPS takes the thought provoking and brilliant concepts of the Nesivos Shalom and “translates” them intocontemporary terms. 2) 48: By Rabbi Nachman Seltzer – People are following our Sages 48 ways to incorporate Torah into our lives. These are their stories. 3) Maran Harav Ovadia: By Rabbi Yehuda Heimowitz – An authoritative biography detailing the life of one of the great Torah leaders of our times. 4) Look What My Parents Give Me: By Sara Ginsburg – Teach your children the importance of respecting what their parents do through fun rhymes and cute illustrations. 5) Positive Word Power for Teens: By Chana Nestlebaum – Set up for daily study, this latest project from the Chofetz Chaim Heritage Foundation teaches teens the power of their words. 6) Imagine If: by Rabbi Zeegel – Imagine if Hashem hadn’t made the world so perfect. Imagine if you could teach your children important lessons through hilarious rhymes and adorable illustrations. 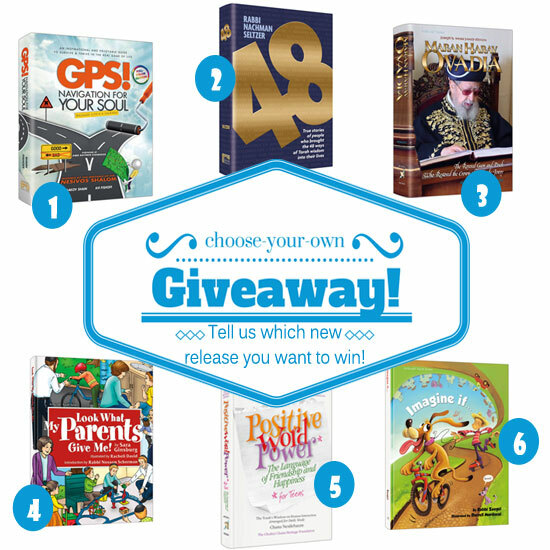 Comment on this post letting us know which of these new titles you would like to win. Want another chance to win? Enter the contest on Facebook too! **Giveaway ends on Monday, June 16th at 11:59 pm eastern time. Prize can be shipped within the USA. Winner will be notified via email. Valid email address must be provided to claim prize. Limit one entry per person on the blog and an additional entry per person is available on Facebook. My Kids would love to get the book Imagine If! My daughter might like 6, Imagine If. I would like to win the #6 Imagine It! book for my 1 yr old and 10 yr old grandchildren that live with me. I know they would love it! #4 Look What My Parents Gave Me! Looks like a great book, and my daughter is just getting into rhyming books. Maran HaRav Ovadia, #3!! Thank you! It’s a hard choice. I would certainly like to win the book about Maran Ovadia Yosef. As second choice, I would pick 48 by Nachman Seltzer. I have come to appreciate his stories and books. I would like ‘Imagine If’ for my adorable grandchildren. Maran Harav Ovadia will be a good read! Definitely Imagine If! Perfect for my daughter. I would love to win number 3!!! I’m sure the book is loaded with interesting stories. Boy-you don’t make it easy! I would like GPS, my older kids would like the word power and the younger set would love Imagine if!!! What a choice! The new biography. I’d like to read it! I would love to have 3 Maran Harav Ovadia, if it was not for the great ravs defending the right of the Ethiopian Jews to return to Israel I would never have met my wife or be expecting our first child in July. B”H may his neshama recieve the greatest aliya in the highest realms of Gan Eden! Would like to win 48. Was already thinking of buying it. No 3. In our lifetime there have been many huge rabbinical minds, but Rav Ovadia Yosef must rank among the greats. Composer of prayers, builder of a huge religious political movement in Israel, revivor or Sephardi observance among many assimilated or Ashkenazi-educated Israelis of Sephardi origin. Personally, as an Ashkenazi with great forebears, among them the Gaon of Vilna and the Hamburg Horowitz, I see the Sephardi revival as a great counterpoint to the Ashkenazi and Hasidic streams of observance. GPS would be my choice. I’d like 3) Maran Harav Ovadia: By Rabbi Yehuda Heimowitz. Maran Harav Ovadia. i heard some stories after he died and imagine there are many more, plus if my kids are anything like me they’ll eventually want to rad it too. I would love to win 48!! The life-story of a Gadol is most inspiring. I would love to win Positive Word Power for Teens. Would love Maran Harav Ovadia! Would like to win # 3. It would be great to read about one of the gedolei hador that was great in torah but also kept a special kesher with everyone. My family is very interested in the Maran Harav Ovadia book! I am interested in the Maran Harav Ovadia book. Does the implied promotion of Facebok Twitter and other social Media have the approval of Gedolim? These sites cause trouble in terms of tzniyus, relationships, why is Artscroll using them? i would appreciate bringing the postive word power for teens into our home. Thanks! I’d like to win GPS! Imagine If sounds really nice! I would like 48: By Rabbi Nachman Seltzer. All of his books are life changing. Maran Harav Ovadiah. I’m proud of my sefardi heritage!